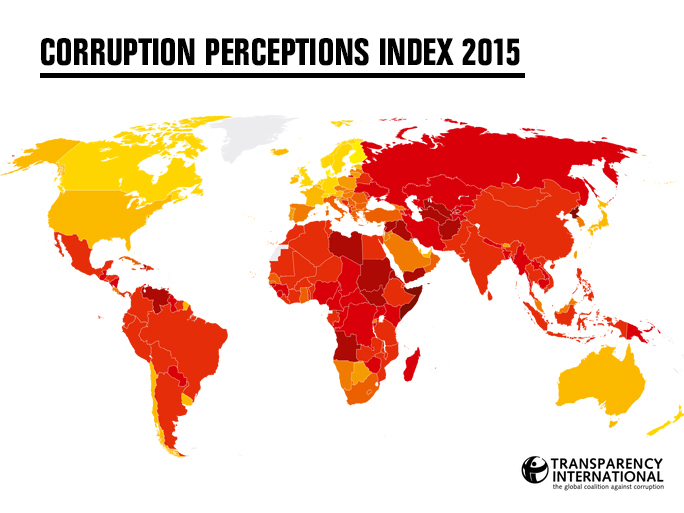 According to 2015 “Transparency International” (TI) Corruption Perceptions Index (CPI) research Lithuania scored 61 points out of 100 and took 32nd place in the list of 168 countries. Lithuania is at 18th place among the EU and Western European countries. Last year Lithuania was 20th. In 2014 Lithuania received 58 points and took 39th place in the 168 countries list. In CPI 2015 Denmark again is no. 1, having received 91 points. Last on the list are North Korea and Somalia (8 points each). Estonia got 70 points and 23rd place (last year – 69 points and 26th place), Latvia – 55 points and 40 place (last year – also 55 points and 43rd place), Poland – 62 points and 30th place (last year – 61 points and 35th place). TI’s CPI is one of the best corruption perception indicators in the world, which shows how world countries manage to tackle corruption. The position is indicated by a particular score in one hundred points scale from zero till 100, in which 0 indicates a total corruption in the country, and 100 stands for a completely transparent country. Corruption scale in public and political sectors is estimated by multidisciplinary experts and business leaders. “According to business enterprise owners in Lithuania, we see that corruption level in Lithuania is shrinking, an in particular, it less hinders businesses. Although, experts note that politicians and civic servants must be more accountable to the public and also that newly adopted laws still lack efficiency. Therefore our most important homework is clear. We must make lobbying less corrupt and essentially improve the quality of public services”, said Sergejus Muravjovas, head of “Transparency International“ Lithuanian Chapter. Eight resources were used to determine Lithuania’s CPI in 2015: 1. Bertelsmann Foundation Transformation Index; 2. Bertelsmann Foundation Sustainable Governance Indicators; 3. IMD World Competitiveness Yearbook; 4. Political Risk Services International Country Risk Guide (ICRG); 5. World Economic Forum Executive Opinion Survey (EOS); 6. Economist Intelligence Unit. Country Risk Ratings; 7. Global Insight Country Risk Ratings; 8. Freedom House Nations in Transit. More about CPI results in Lithuania can be found here (report in Lithuanian). More information: Sergejus Muravjovas, tel. : +370 689 97579, sergejus@transparency.lt. More information about the global CPI statistics can be found here: http://www.transparency.org/cpi2015.